Written by Ian Flynn with art by Evan Stanley and Tracy Yardley, “The Battle For Angel Island” continues in IDW Publishing’s series Sonic The Hedgehog. For those of you unfamiliar, it is based on the classic video game of a speedster blue hedgehog stopping an evil genius named Dr. Robotnik (called Dr. Eggman in this series.) Do not worry. There are no spoilers ahead. To recap, Sonic and his friends including Amy Rose, Tails, and Knuckles the Echidna have succeeded in stopping Dr. Robotnik (I refuse to call him Eggman). The former evil genius is living with amnesia in a village where he acts as a Mr. Tinker. However, Metal Sonic (an evil robot version of Sonic) has taken over for his former master. In issues 7-8, he has led an attack and taken over Angel Island and the mystical Master Emerald. In issue 9, the team managed to infiltrate Angel Island, Sonic and Knuckles confronted Neo Metal Sonic, who absorbed the power of the Master Emerald. 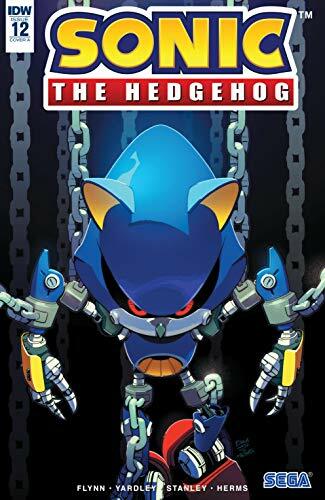 In issues 10, 11, and 12, Sonic, Knuckles, Tails, Amy Rose, and a host of new characters and old characters from the video games, battle Neo Metal Sonic before he can use the power to take back Dr. Robotnik’s land. Even Shadow the Hedgehog and Rouge the Bat got involved to stop the vicious attack by the evil robot. Meanwhile, the evil Dr. Starline has kidnapped Mr. Tinker in order to turn him back into Dr. Robotnik. You never know what to expect with new series about your favorite video game characters. IDW Publishing, with Ian Flynn has brought the character to new heights in the pages. Likewise, Evan Stanley and Tracy Yardley’s artwork perfectly complement the tone and style of the series. It has really done a good job of retelling Sonic’s story and I look forward to new issues. What do you think? Let me know in the comments below. Tell me if there is a comic book, movie, or novel you would like me to review. While you are at it, read my movie review Conversations with a Killer: The Ted Bundy Tapes and my thoughts on the newsboys song Greatness Of Our God. Don’t forget to like, share, and subscribe for more posts like this one.